If I told you to picture vinyl flooring, you would probably conjure up images of your grandmother’s kitchen floor, with an ugly pattern and plenty of cracks and peeling. Vinyl flooring doesn’t usually make people think of style and luxury. However, vinyl flooring products have come a long way since your grandmother’s kitchen! 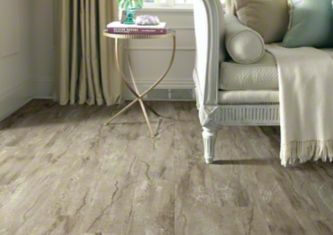 There are so many vinyl flooring options available today that are stylish, luxurious, and durable to boot. Vinyl has always been a quick and easy way to update your flooring; now it’s also a modern and fashionable choice. One of the vinyl products on the market that I really love is Floorte, a vinyl planked flooring from Shaw. This vinyl flooring looks like hardwood, but is durable and waterproof. It’s a great choice for high-traffic areas, families with pets or young children, or anyone who is looking for a solution that looks great but can take a beating. Vinyl flooring is also incredibly easy to install, which can mean a quicker turnaround and more affordable project. Best of all, products like these look so much like wood flooring that your home guests will never be able to tell the difference. Are you interested in learning more about modern and elegant vinyl flooring options? I recommend stopping by our showroom to see these products in person. You’ll also be able to talk with our team, who can help you find the perfect flooring to meet your needs. We’ve got a special financing program going on through May, so it’s the perfect time to upgrade your space. Come see us today!